Making a living as a freelance copywriter definitely has its merits. When you’re in my line of work, you choose your own hours, you don’t have a boss to answer to and you can work from anywhere there’s an Internet connection. There’s also a lot of money to be made. The more financially motivated freelance copywriters can command as much as six figures per year. But for me, the best thing about being a copywriter is that it allows me to enjoy the type of lifestyle that I’ve always wanted. 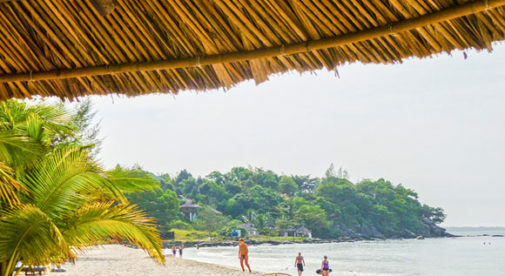 Right now, I’m living and working in Southeast Asia—in a sunny, laid-back little beach resort town called Sihanoukville in Cambodia. I could go hunting the big paychecks—but when the cost of living is as low as it is here, I prefer to work a couple of hours a day and spend the rest of my time enjoying this incredible, exotic part of the world. When I do work, I can easily write copy and manage projects from almost anywhere. Even by the pool. As I traveled throughout this part of the world, I discovered that rent (like everything else here) is cheap. It averaged out to about $14 a day for a room with air-con, hot water showers, and digital TV with English-speaking channels. But I recently decided to establish a “home base.” A place to live that’s more intimate and personal than any generic room at a beach resort. My new residence is a 2,000-square-foot, six-bedroom, seven-bathroom home about a mile inland from the golden sand of Serendipity Beach. See for yourself in the photo above. It’s got a fully-equipped kitchen, twice-weekly maid service, high-speed Internet access, digital TV, a huge living room, a large balcony on the second floor, a makeshift basketball court, plenty of room for parking, and more. There’s even a black-and-white cat that lives here called “Baba Ghannouj.” He likes to keep the local bug population in check. My room is 400 square feet with air-con, a bathroom, and a shower. It’s clean, safe and pretty quiet…except for when the roosters and chickadees decide to break into song. My rent is only $100 a month. I’m not sure how much longer I’m going to stay here…or if I’ll ever stay at a beach resort in Southeast Asia again. But with such a low cost of living, a beautiful location and a fun career that covers my costs and more…I think I’ll be staying put for a while.